Corporate Wellness or worksite health promotion refers to the systematic approach endorsed by an organization that is designed to enhance the health of the company and it's most important asset: it's employees. In essence Corporate Wellness is an action step taken by an employer to increase the health and well-being of it's employees. The very term "wellness" suggests an all-encompassing or holistic approach to health. That is to say that a wellness program is more than physical fitness instruction or nutritional education. Although the health of the body is important; equally important is the health of the mind and spirit. Why an Employer should adopt a Corporate Wellness Program. STRESS REDUCTION : High stress levels are one of the leading causes of on-set disease, depression, low energy levels, lack of mental clarity and creativity. By reducing employees stress levels companies will increase overall productivity, employee's positive attitude, while lowering insurance costs. IMPROVED MORALE : "A healthy employee is a happy employee." People who are fit and healthy tend to be happier and more productive at their place of work; and their upbeat and positive attitude tends to be contagious. REDUCED ABSENTEEISM : Corporations lose productivity due to absenteeism every year leaving loss . It is no secret that lifestyle behaviors have a direct correlation with diseases such as high blood pressure, diabetes, cancer and heart disease. By preventing certain illnesses affected by lifestyle choices, employee sick leave decreases dramatically. REDUCED TURNOVER: The cost of recruiting, hiring and retaining a qualified staff in today's job market can be costly not to mention a tremendous strain for employers. Providing wellness programs to employees adds to their benefit package and also demonstrates that the employer cares about the employee's well being. HEALTH CARE COST CONTAINMENT : A recent medical study concluded that sedentary lifestyles increase annual medical costs. If as little as 10% of these sedentary individuals adopted a regular walking program, it is estimated that the medical costs could be saved. Abbas and his TEAM 0f trainers are all qualified Lifestyle & Weight Management Consultants that have the experience and knowledge to help your employees get fit and healthy through the following Corporate Wellness Programs. E-mail us about our free introduction seminar ! Our weight loss program has been extraordinarily successful because we at fitness king focus on realistic behavior modification. This is an 8-week wellness program that can include health screening, body fat measurements and one-on one coaching. Abbas is available to visit your company to discuss how and which wellness program or programs would best benefit your organization. He can help you design a health facility, develop programs for an existing staff or educate existing staff on new training and motivation techniques. We would like to offer you a unique opportunity to develop a long-term successful fitness program in line with your personal goals that is also sensible, functional, and valuable in achieving greater health and longevity for life. We will offer you consistent support and motivation throughout the entire time we are working together! 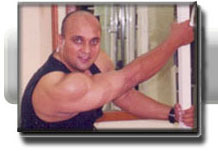 We will design the best workout routine for your fitness level and goals. We will help you work harder, more consistently, and more efficiently than you would on your own. We will provide you with enough guidance and education to ensure that you establish effective exercise patterns right from the beginning! We will educate you on how your body functions and how to train it, in a safe effective manner to achieve the results you want.